wood, demonstrate how to build a fire; light the fire, unless prohibited by local fire restrictions. After allowing the flames to burn safely, safely extinguish the flames with minimal impact to the fire site. 2. Set personal nutritional goals. Keep a food journal for one week; review your journal to determine if the goals were met. 3. Plan a menu for a balanced meal for your den or family. Determine the budget for the meal. Shop for the items on your menu while staying within your budget. 5. Demonstrate an understanding of food safety practices while preparing the meal. 1. Earn the religious emblem of your faith for Webelos Scouts, if you have not already done so. 7. Create and practice an emergency readiness plan for your home or den meeting place. 8. Visit with a first responder. down afterward. Demonstrate the proper way to warm up and cool down. 4. With your den, prepare a fitness course or series of games that includes jumping, avoiding obstacles, weight lifting, and running. Time yourself going through the course, and improve your time over a two-week period. 5. With adult guidance, lead younger Scouts in a fitness game or games as a gathering activity for a pack or den meeting. 6. Try a new sport you have never tried before. 1. Create a hike plan. 2. Assemble a hiking first-aid kit. you might encounter on your hike. 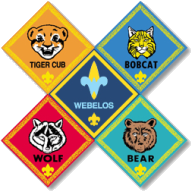 how you can demonstrate them on your Webelos adventures. 6. With your Webelos den or with a family member, hike 3 miles (in the country, if possible). 7. Complete a service project on or near the hike location. lunch leader, or service project leader.